Penetration testing is more important than ever. As endpoints multiply thanks to mobile devices and the IoT, these is not airtight perimeter keeping sensitive information in and threats out, making it harder for organization to safeguard critical data assets. 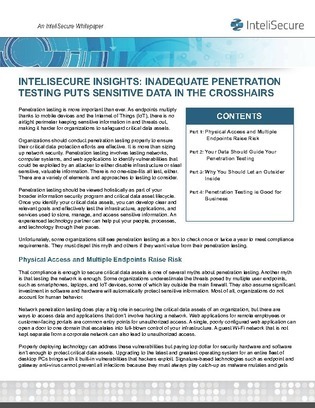 In this white paper, find out why some organizations see penetration testing as a box to check in order to meet compliance requirements and why they must dispel this myth if they want value from the testing.